Fort Lauderdale associate Deedee Bitran recently participated as a panelist at an FIU College of Law Labor and Employment Law Lunch and Learn. 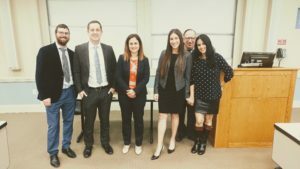 The event was an interactive opportunity for FIU Law students to engage with practitioners while learning more about career opportunities in labor and employment law. The panelists shared advice with attendees on maintaining professionalism, trending issues in employment and labor law, and navigating the current job market. Deedee (third from right) is pictured with Mendy Halberstam of Jackson Lewis; Adam Kemper of Greenspoon Marder; Carmen Manrara Cartaya of the Equal Employment Opportunity Commission; Dean Leonard Strickman of FIU Law; and Professor Kerri Stone of FIU Law.